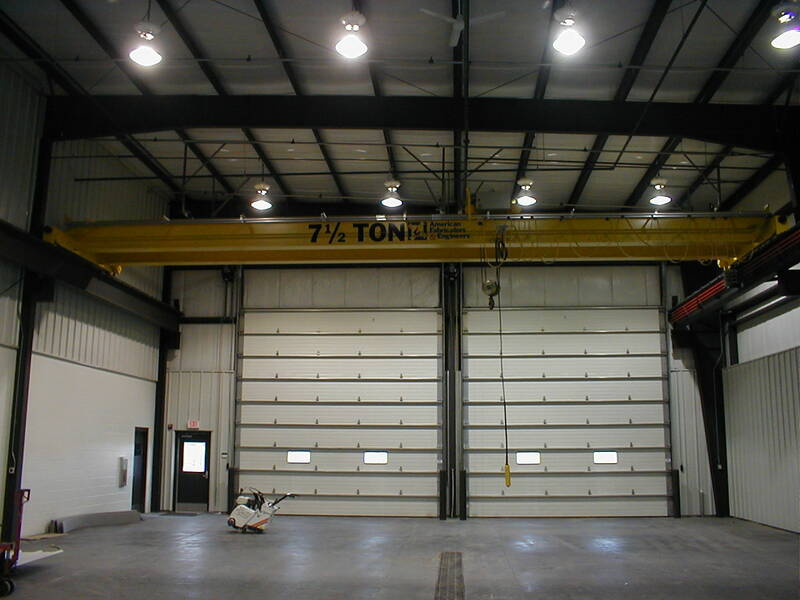 A Top Running Single Girder (TRSG) crane is the most common type of overhead bridge crane. 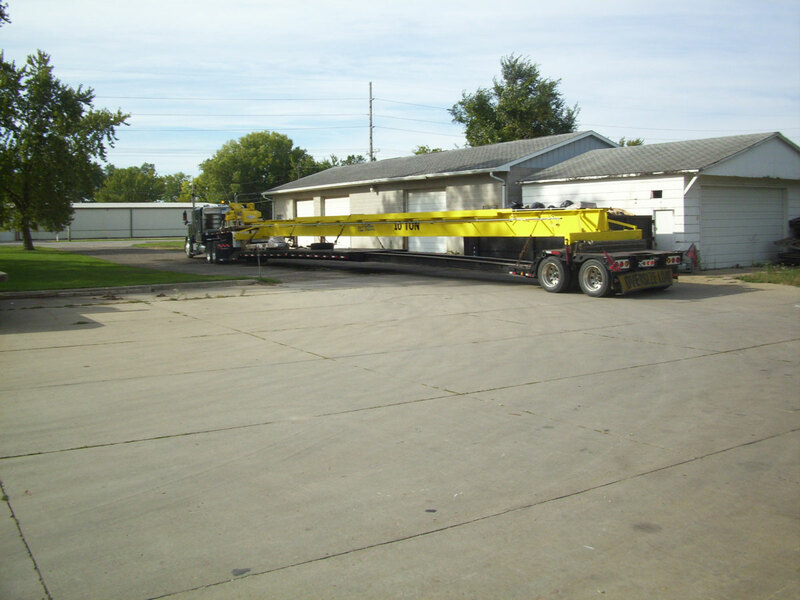 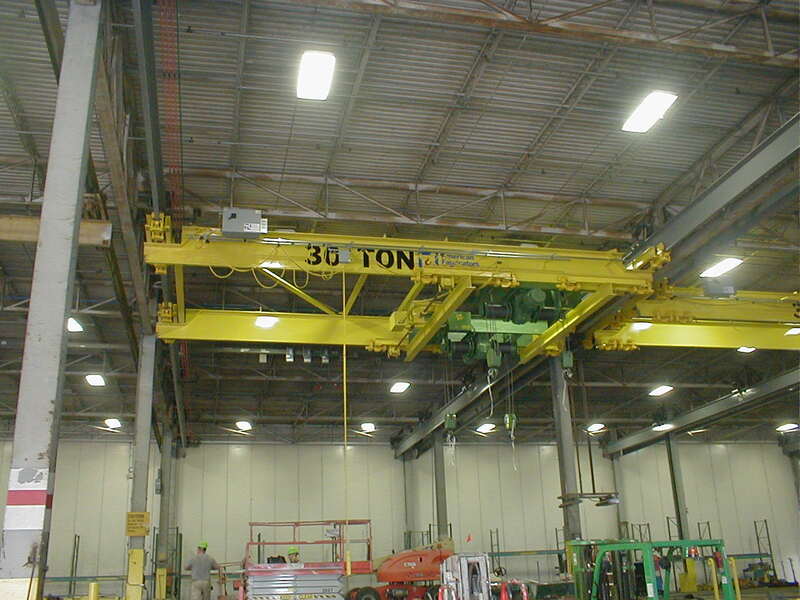 It is a versatile bridge crane that can be utilized for a wide variety of industries. 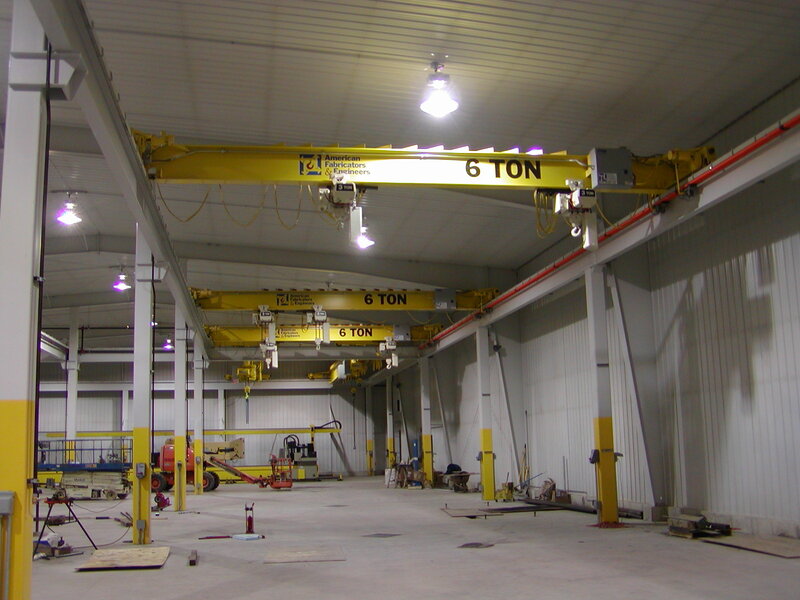 TRSG cranes can be built with capacities up to 15 ton and spans up to 98 ft. 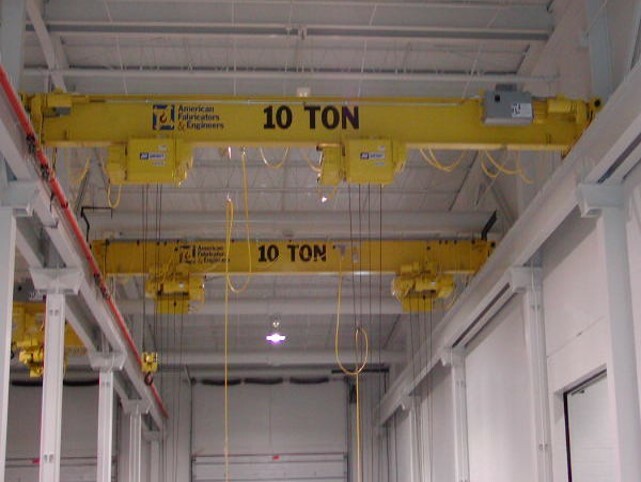 Typically, TRSG crane capacities vary between 5 and 10 ton. 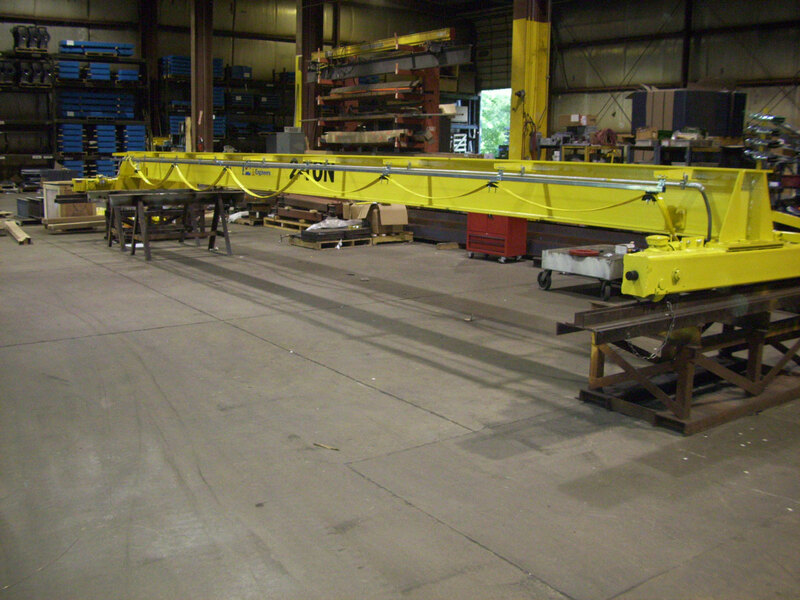 With these capacities, the bridge beam is typically a wide flange structural member. 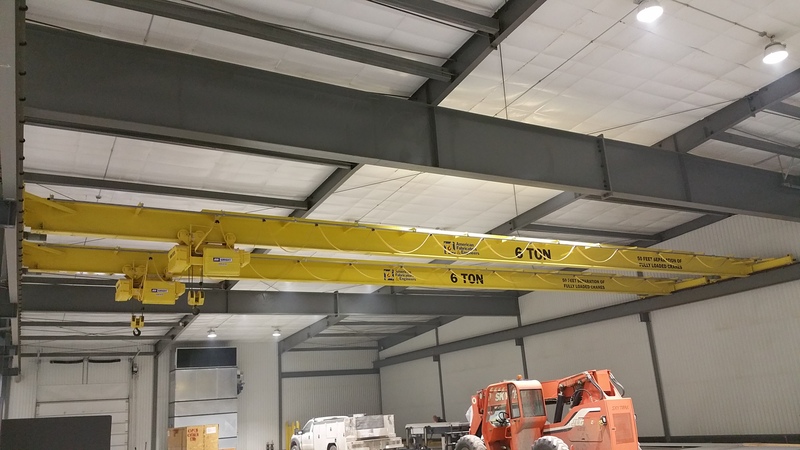 Most cranes that exceed a capacity of 10 ton with a span greater than 60 ft will utilize a box girder bridge beam. 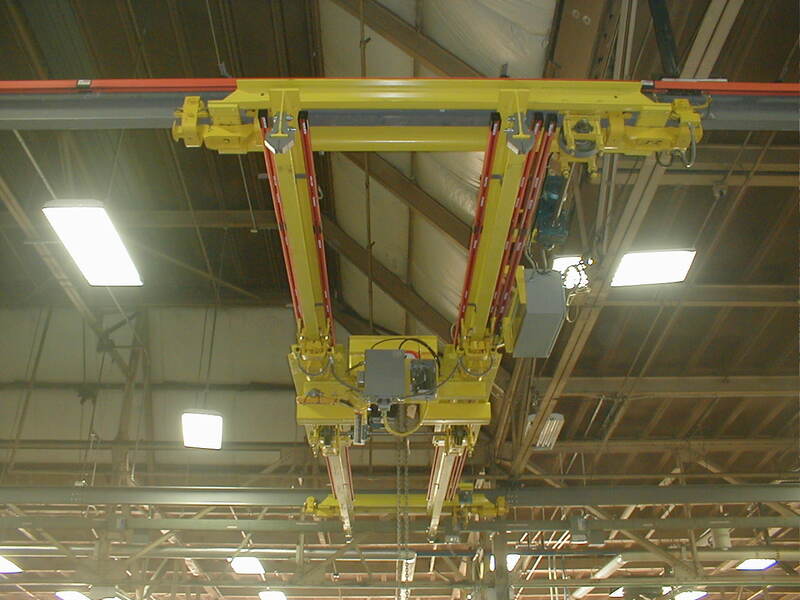 The hoist/trolley used on a TRSG crane is always an under hung style trolley which runs on the bottom flange of the bridge beam. 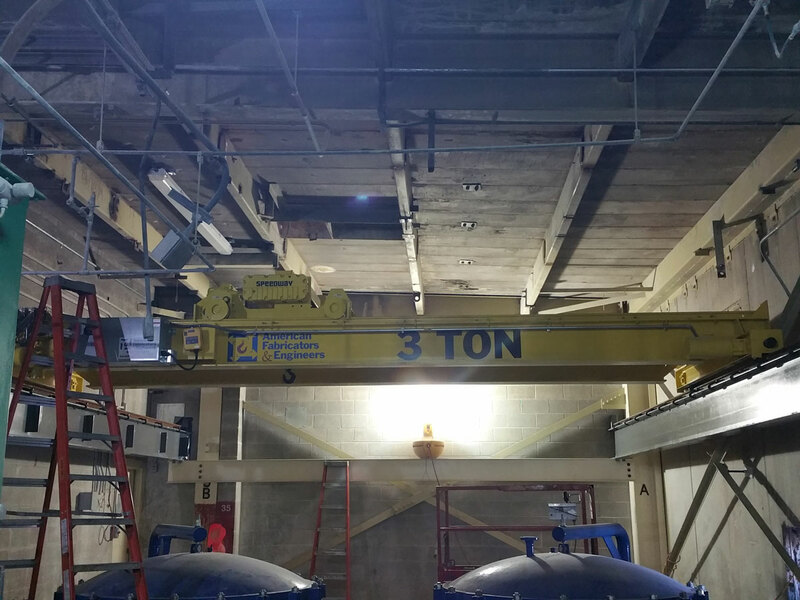 For this reason, a TRSG crane is not the best crane option if facility headroom is a major issue. 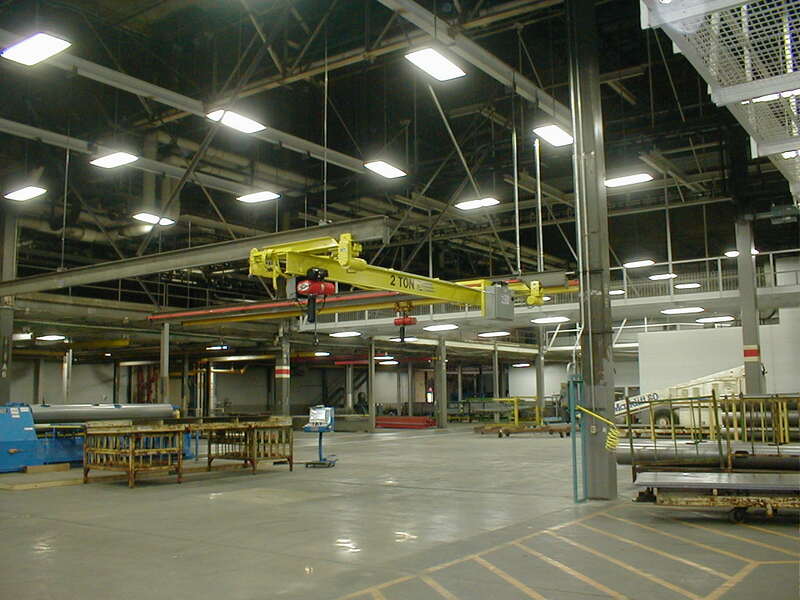 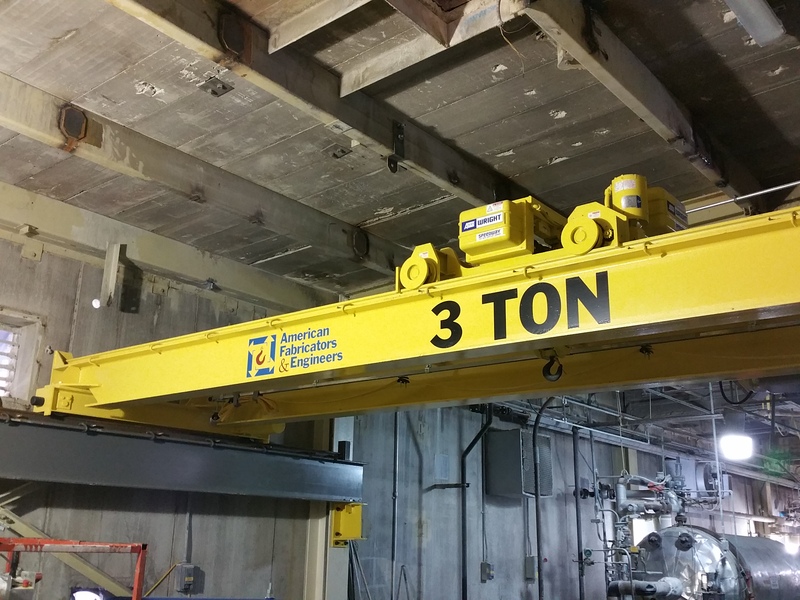 See Top Running Double Girder cranes if headroom is a key factor. 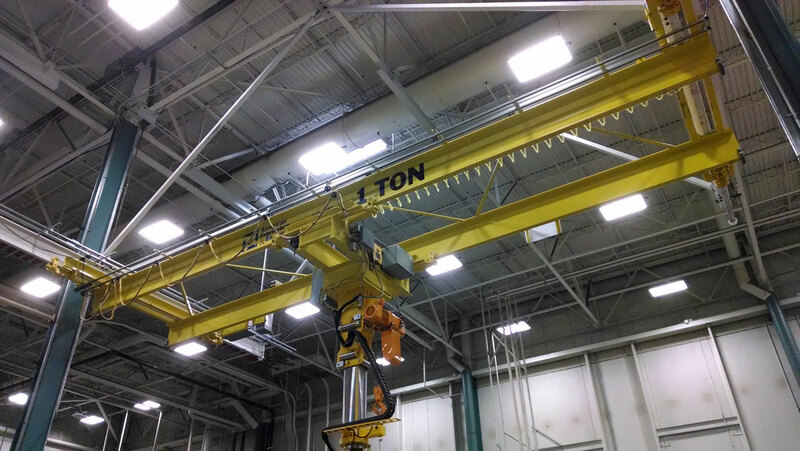 Top Running Single Girder cranes use end trucks that operate on ASCE rail or square bar that is attached to the top of the runway beam. 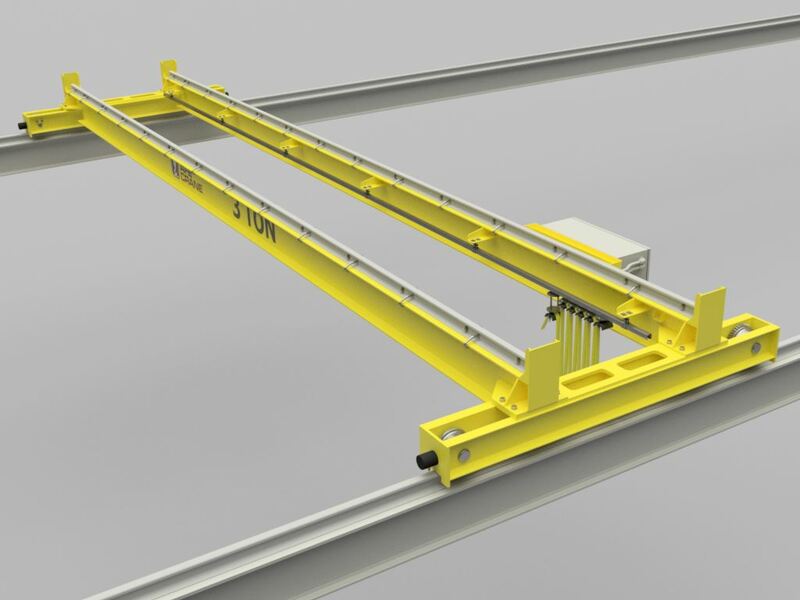 The runway for TRSG cranes can either be building supported (if building is suitable) or by using a freestanding runway system. 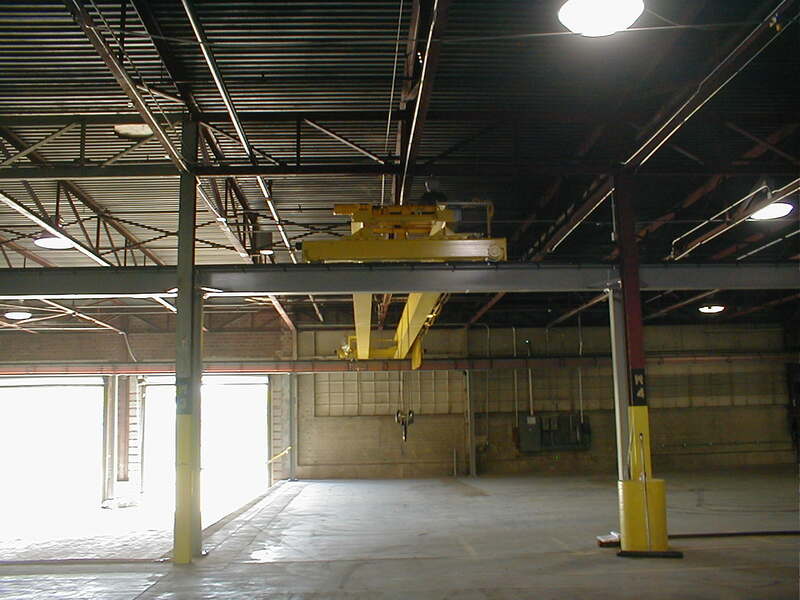 The runway beams generally span across a full building bay. 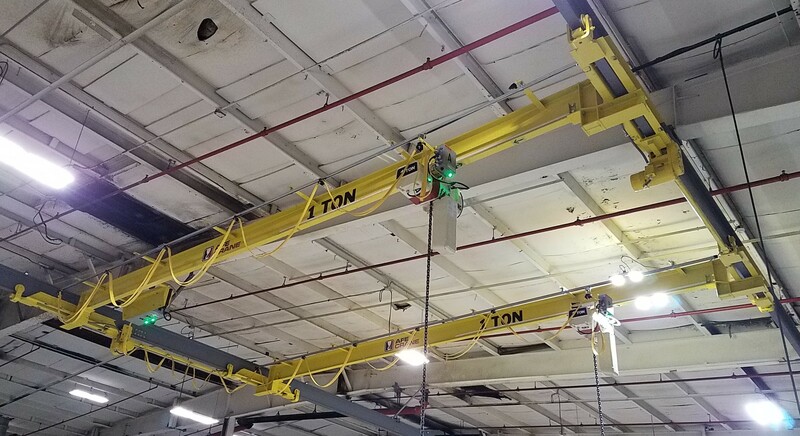 One downside to any top running crane is that the hoist/trolley is not able to travel beyond the runway, limiting the hook coverage area of the hoist/trolley. 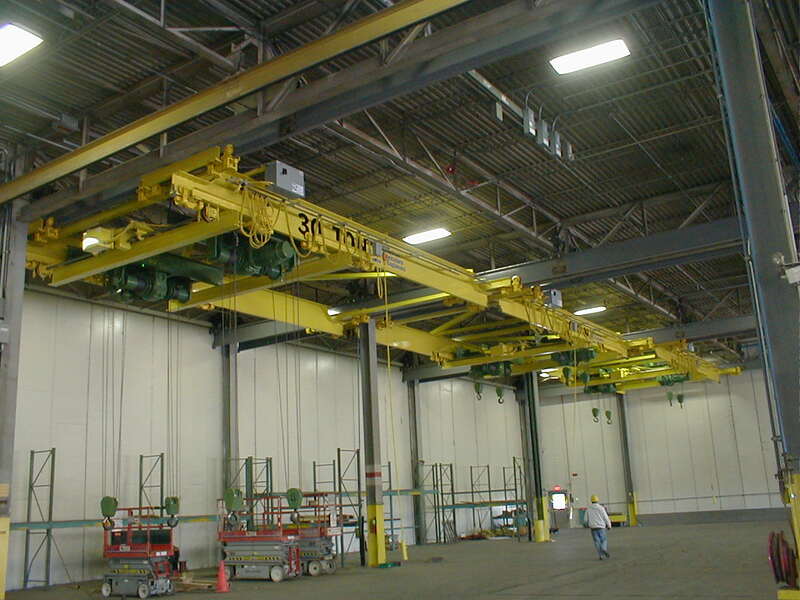 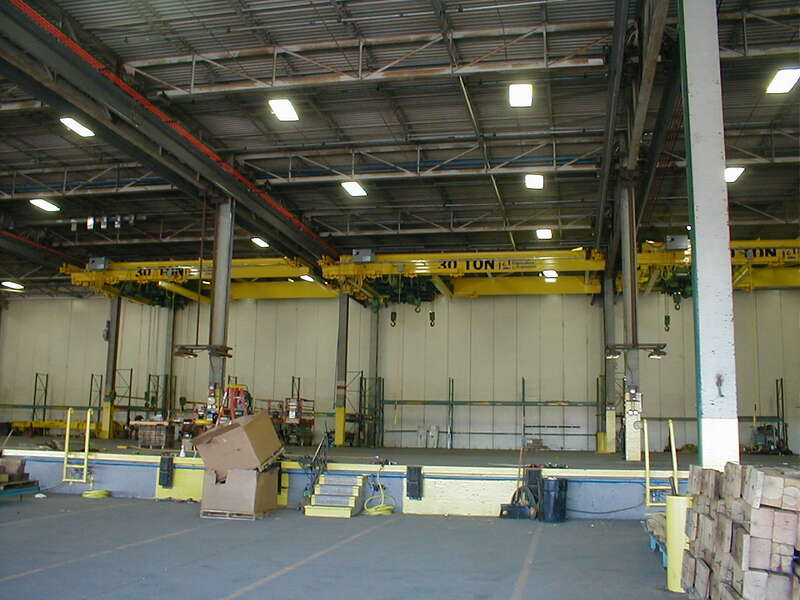 See Under Hung Single and Double Girder cranes if maximum hook coverage is required. 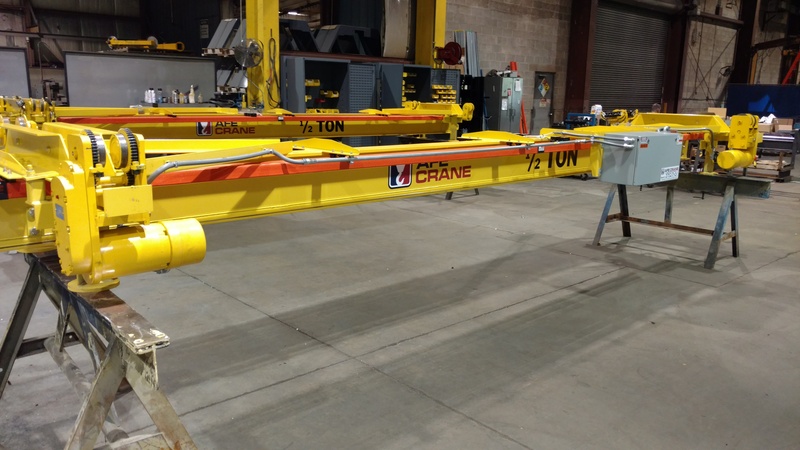 A Top Running Double Girder (TRDG) crane is similar to a TRSG crane, except for an additional bridge beam. 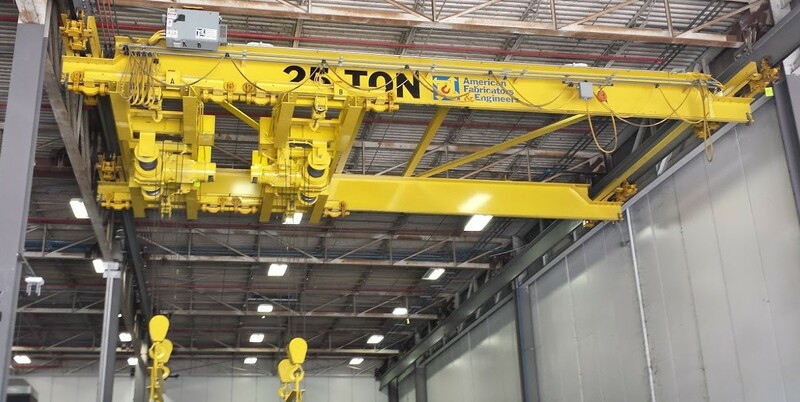 The additional girder increases the capacity capability to 30 tons. 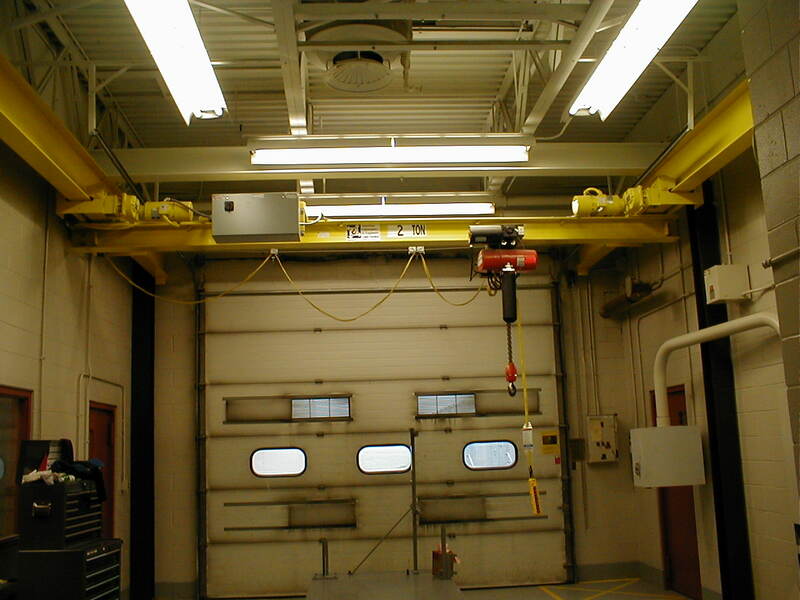 With the addition of a second bridge beam, both top running and under hung hoist trolleys can be used. 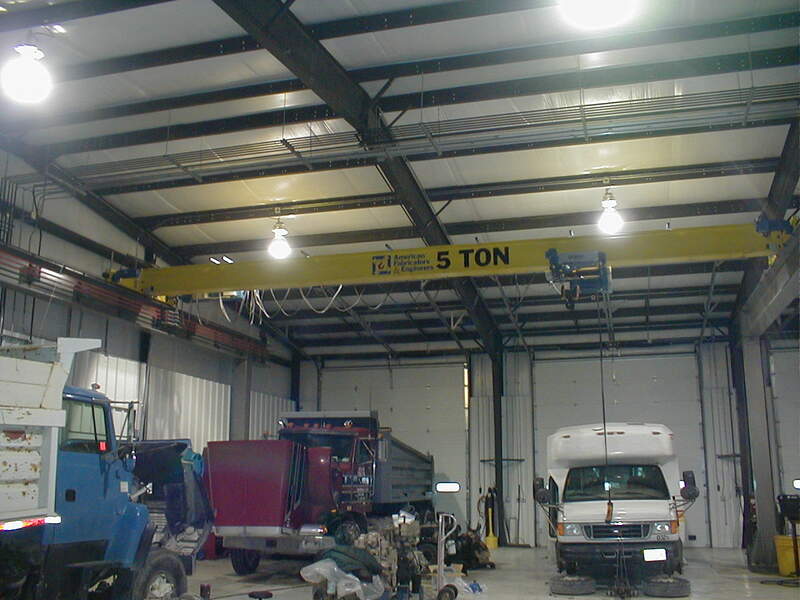 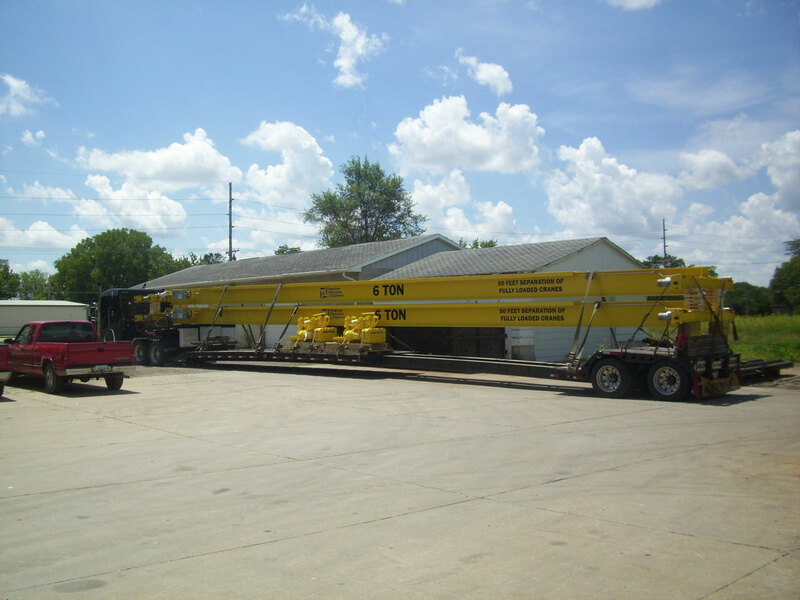 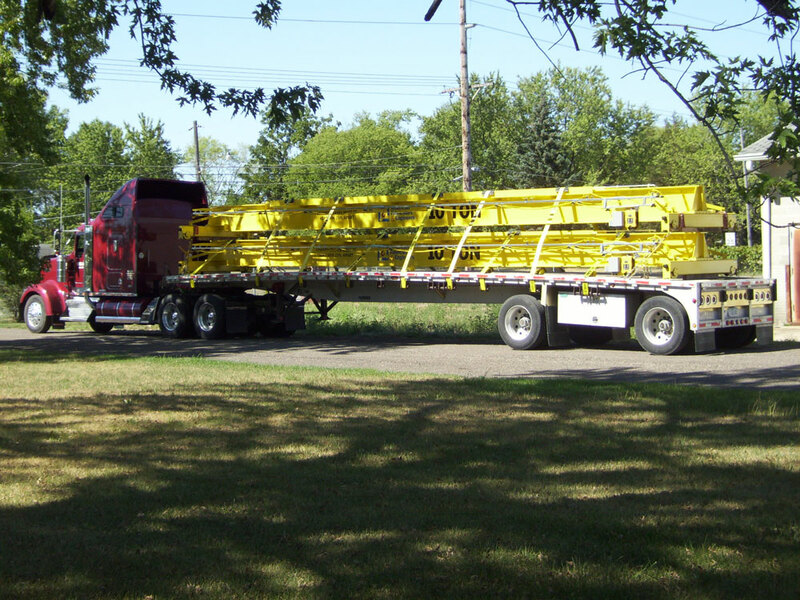 For most cases, a TRDG crane can have the best high hook (compared to other crane styles) because the hook can be mounted between the two bridge beams. 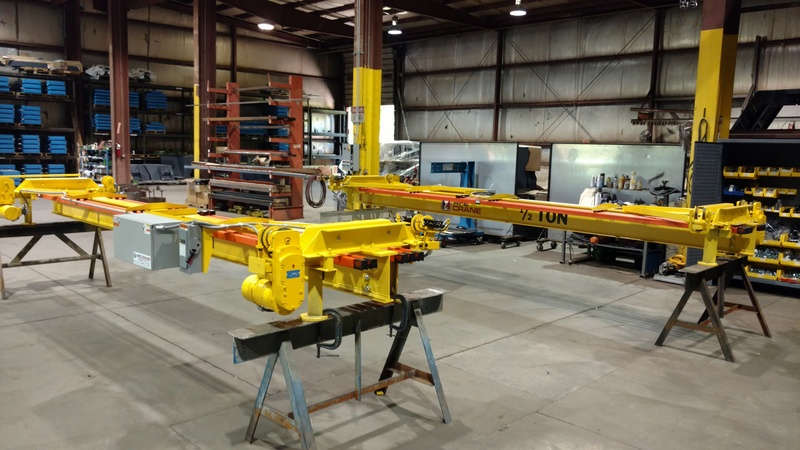 Double girder cranes also have a better means of handling large moments caused by a stackers, part manipulators or components other than a hook. 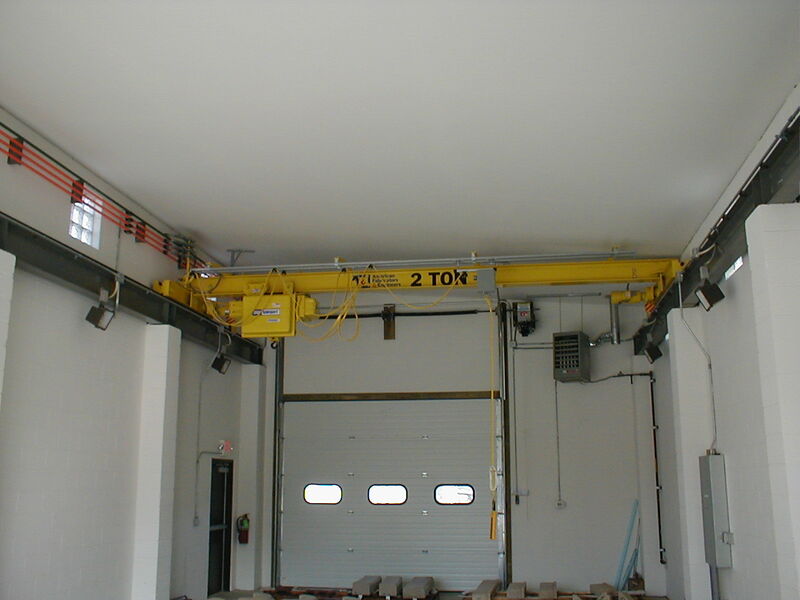 An Under Hung Single Girder (UHSG) crane (a.k.a. 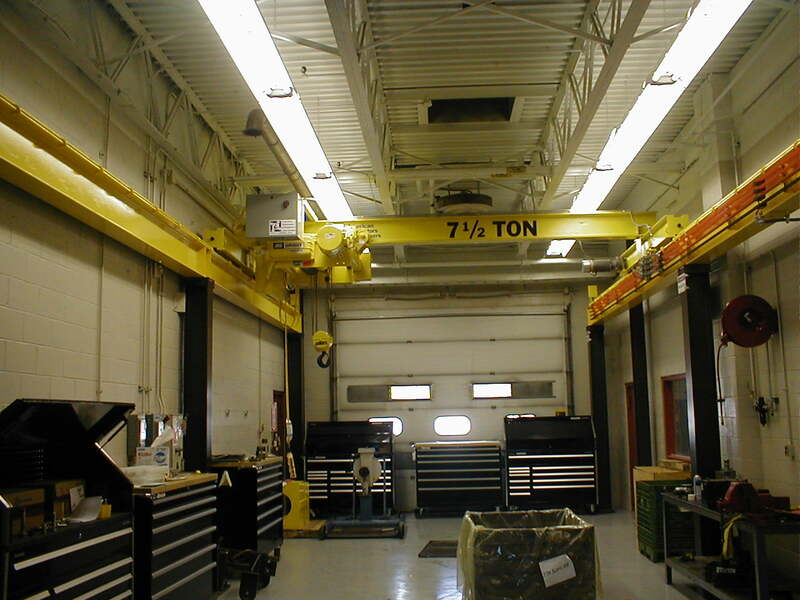 under running crane) is the most common type of bridge crane for low lifting capacities. 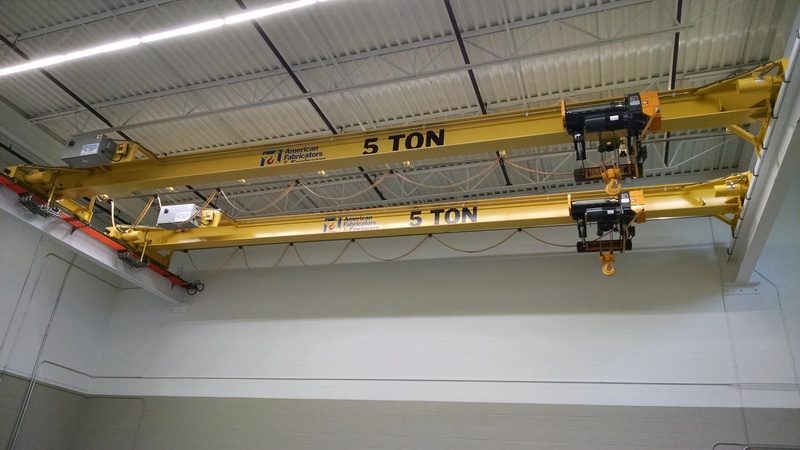 Being one of the most economical styles of bridge cranes, these cranes are most popular in high production rate facilities and assembly plants. 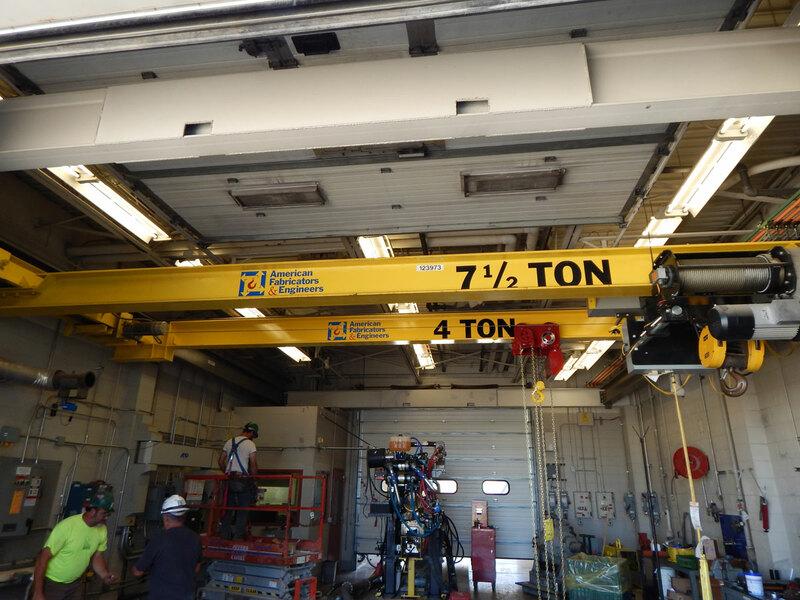 UNSG cranes can be built with capacities up to 10 ton and spans up to 60 ft. Just like TRSG cranes, UHSG cranes use a wide flange structural bridge beam and an under hung style trolley running on the bottom flange of the bridge beam. 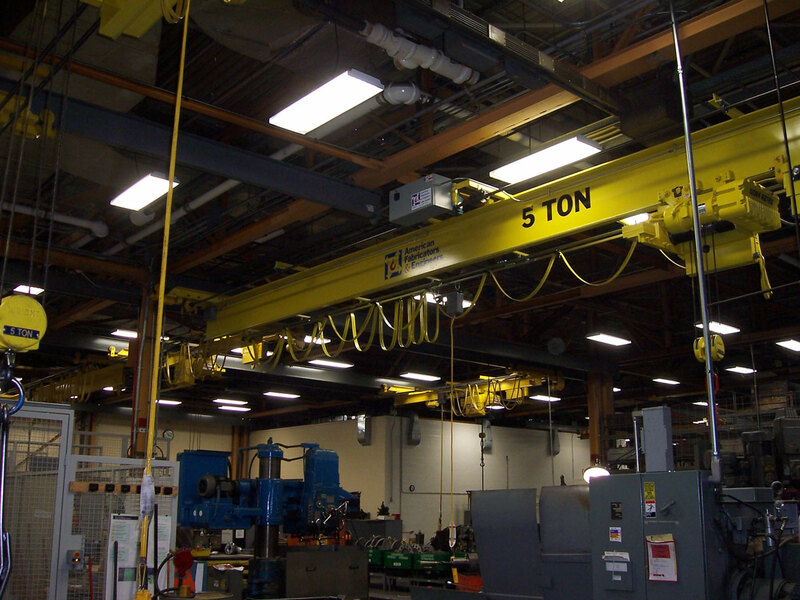 Under Hung Single Girder overhead bridge cranes run on the bottom flange of a structural or patented track runway beam. 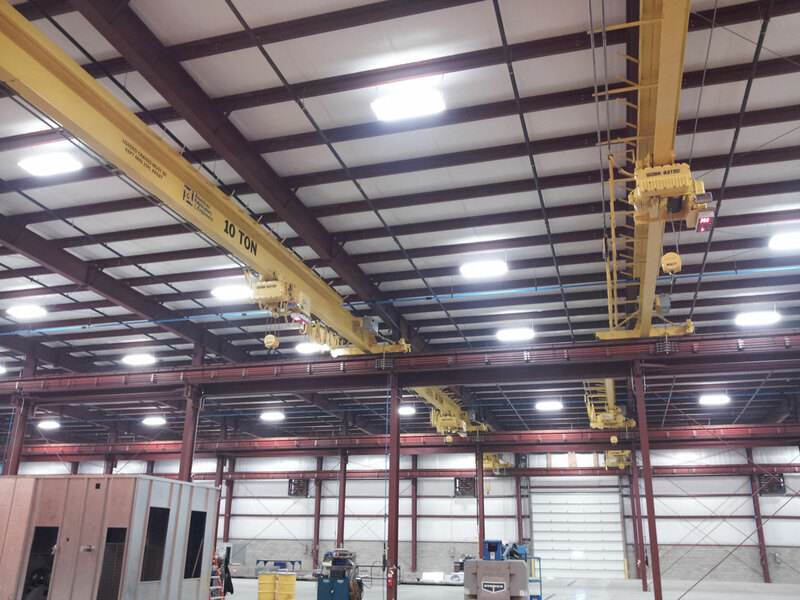 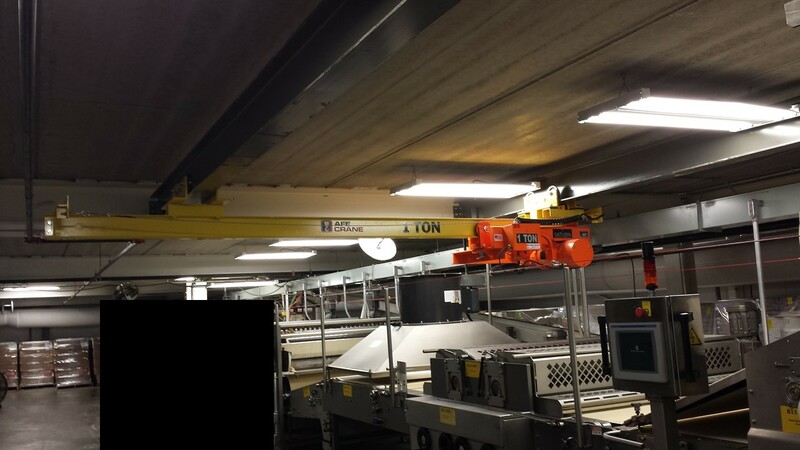 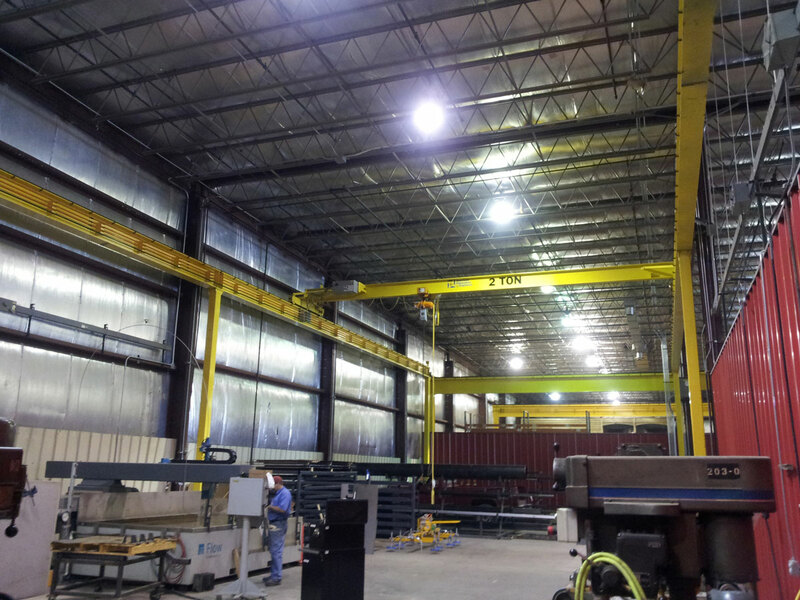 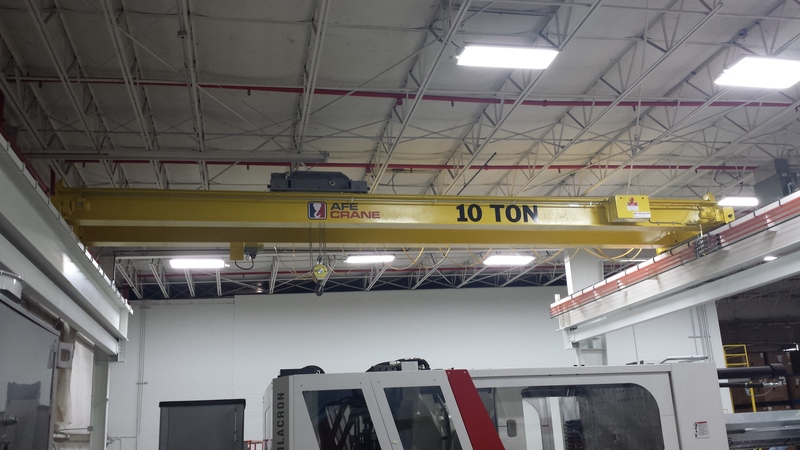 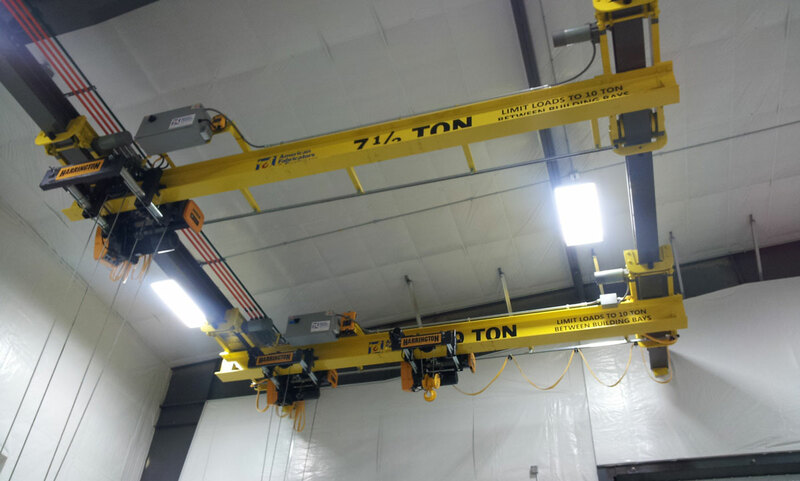 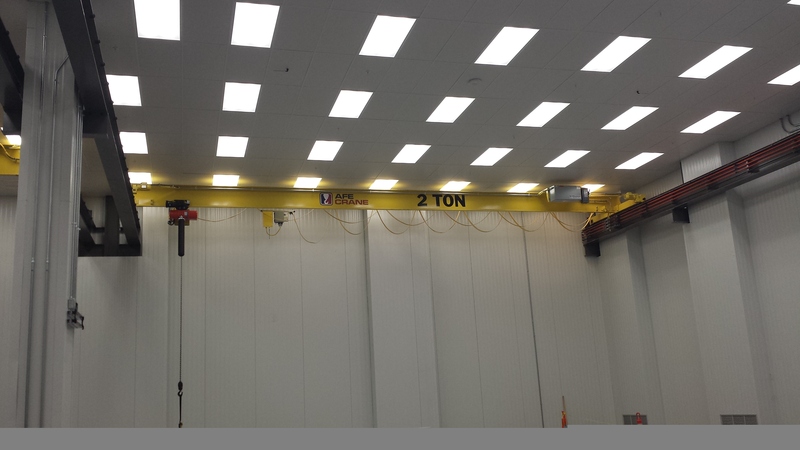 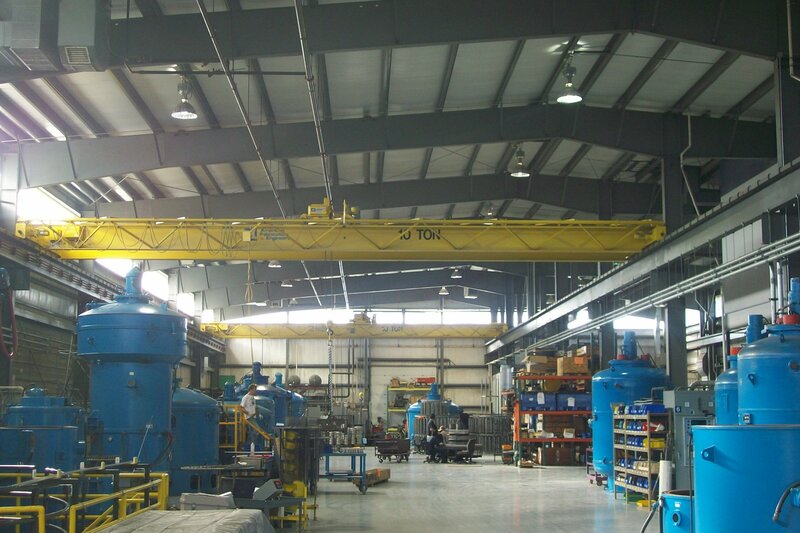 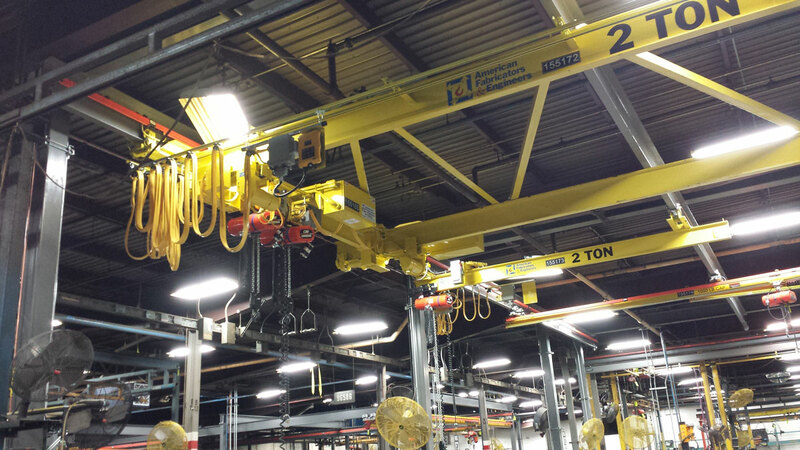 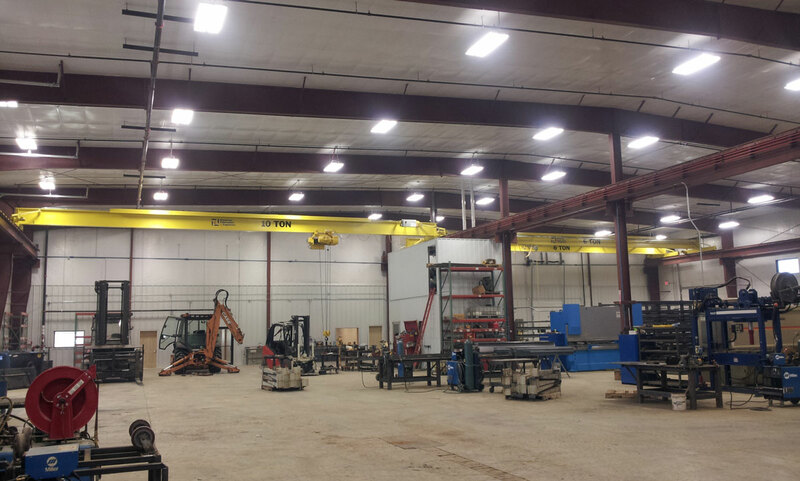 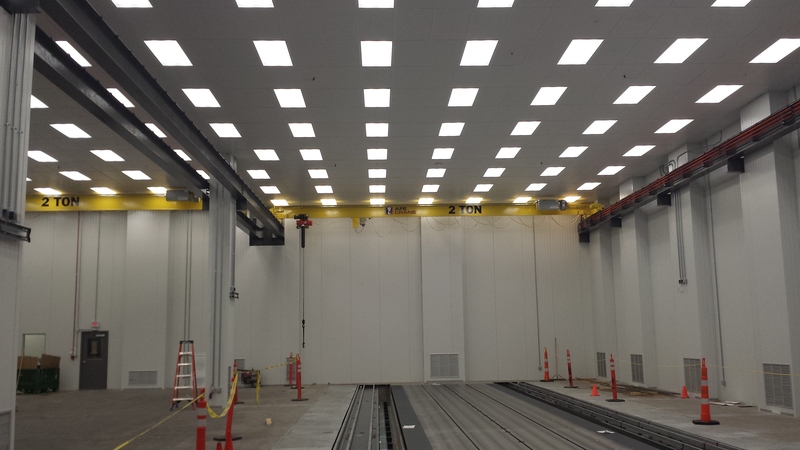 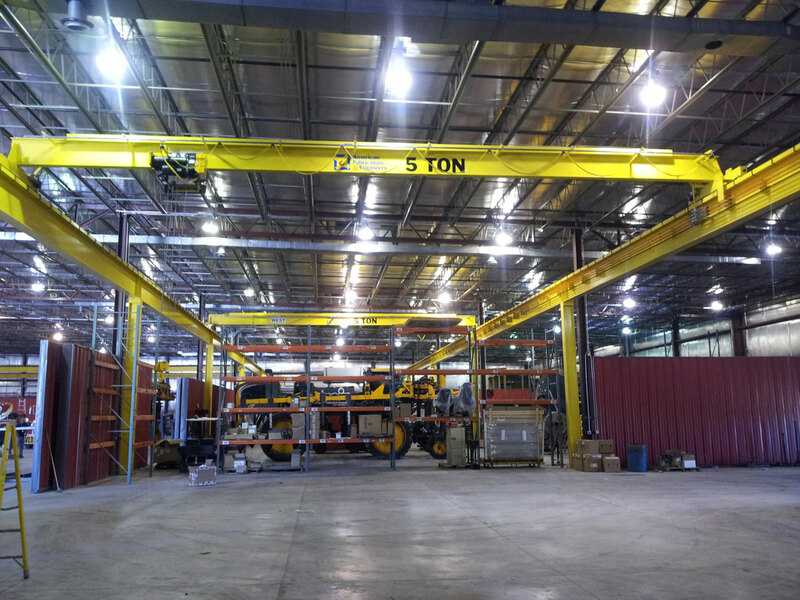 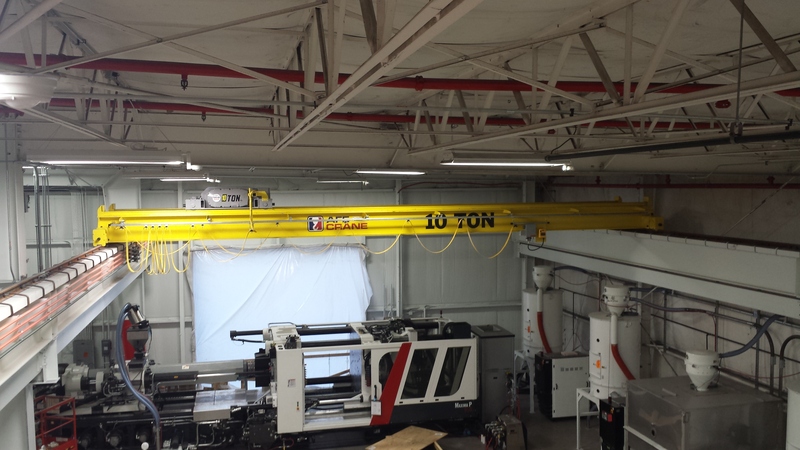 Because of this, UHSG cranes typically take up a fair amount of headroom in the customer’s facility. 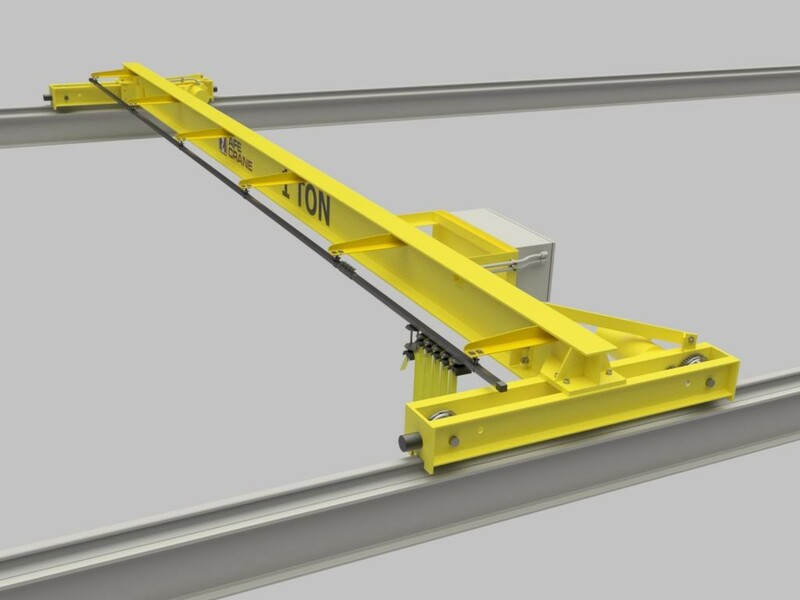 However, more headroom can be achieved by modifying the beam to end truck connection but hoist/trolley end approach may be reduced. 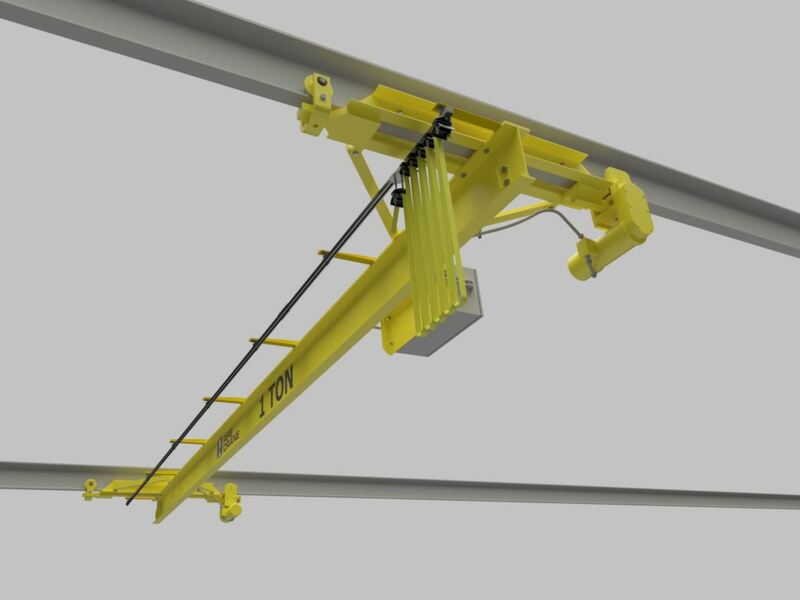 Hoist/trolley end approach is greatly increased on UHSG cranes, so much so that the hoist hook generally can travel under the runway. 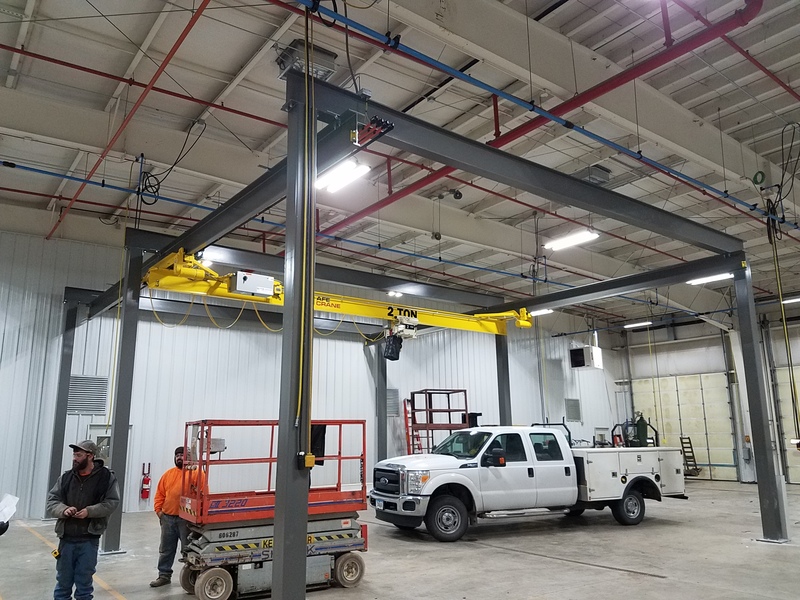 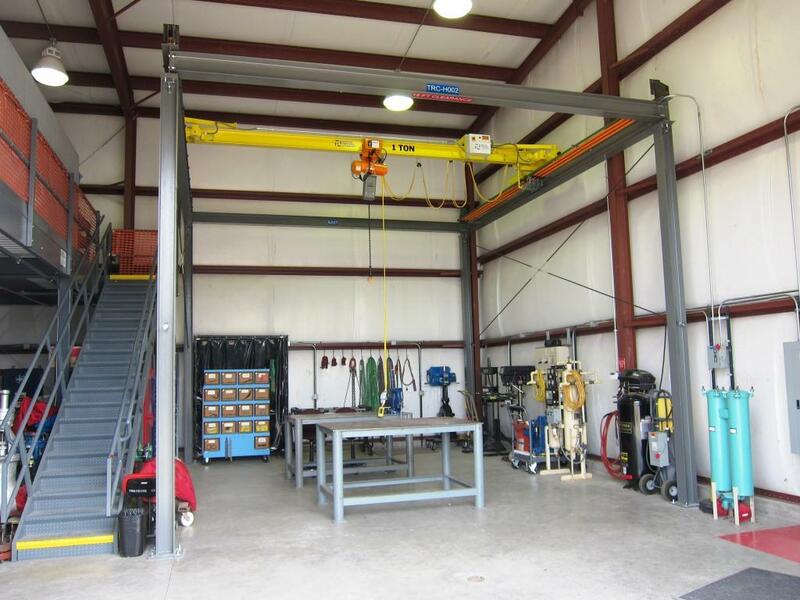 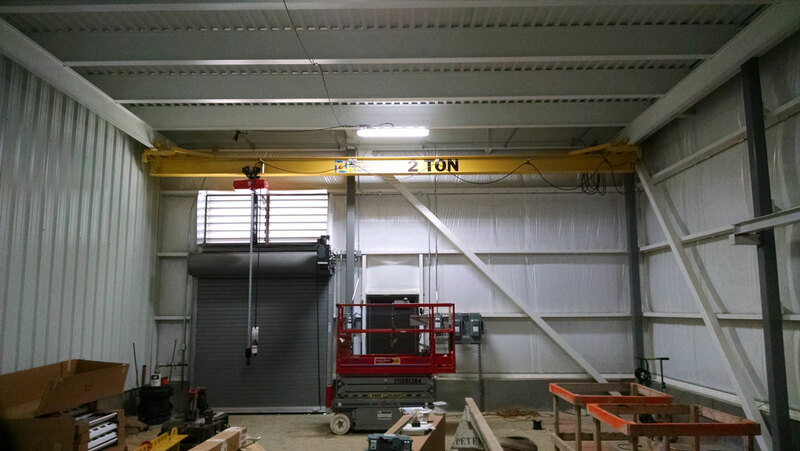 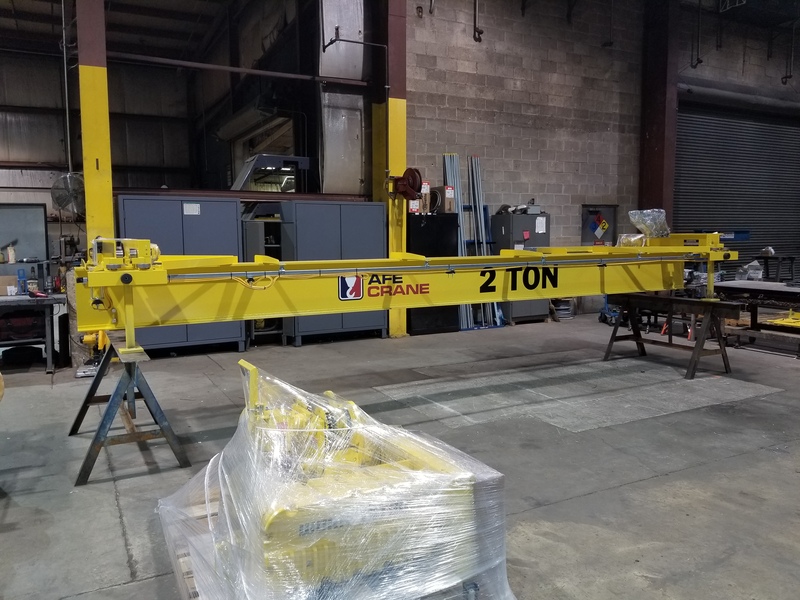 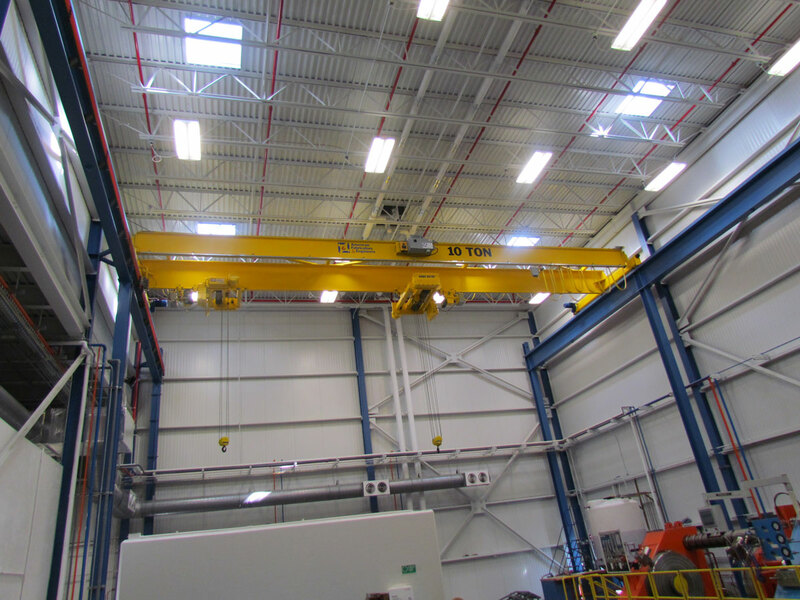 Additionally, this style of crane can also be designed with a cantilever or projecting (telescoping) bridge that will allow the hoist to travel up to 5 ft beyond the centerline of the runway. 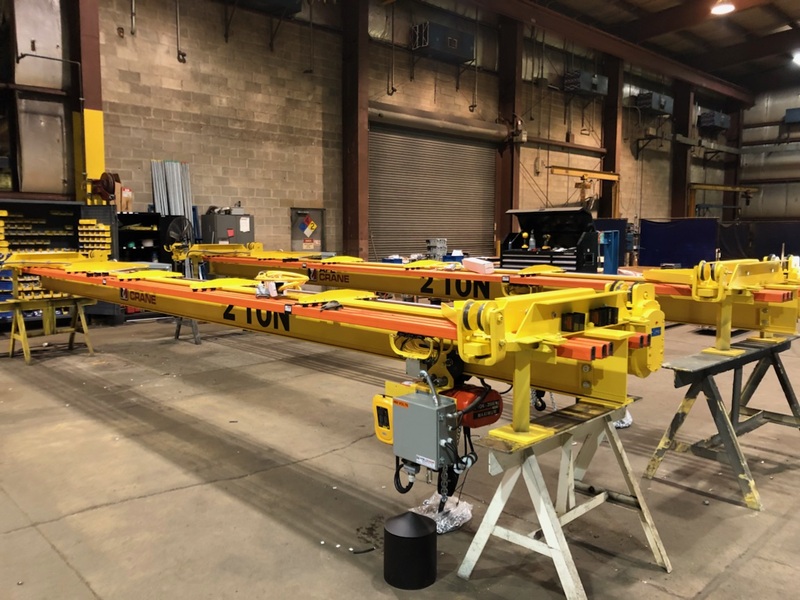 UHSG cranes that use a patented track bridge beam also have the capability to latch onto spur rails and/or monorail systems to improve workflow and increase productivity. 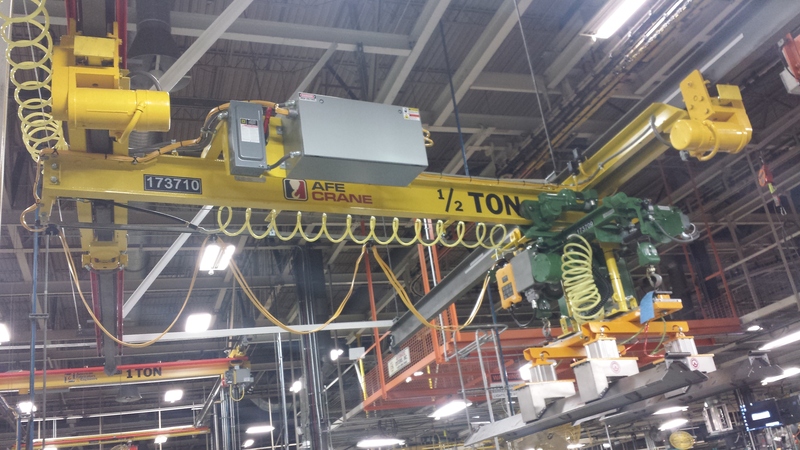 Another advantage of UHSG cranes is the option to add additional end trucks (and runways) to the crane. 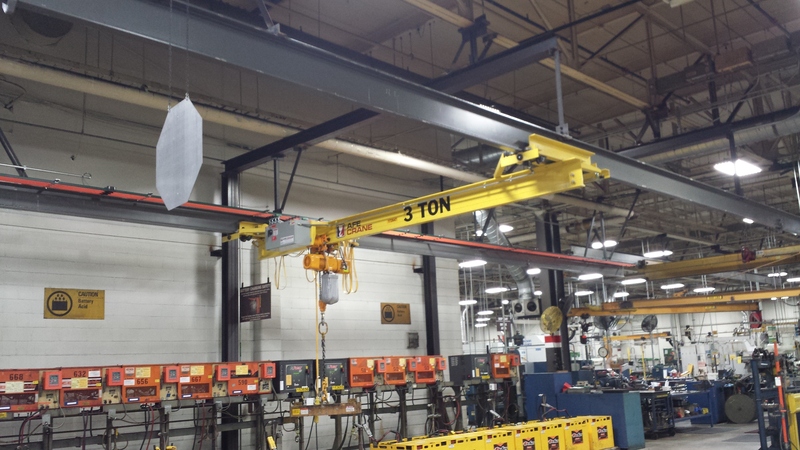 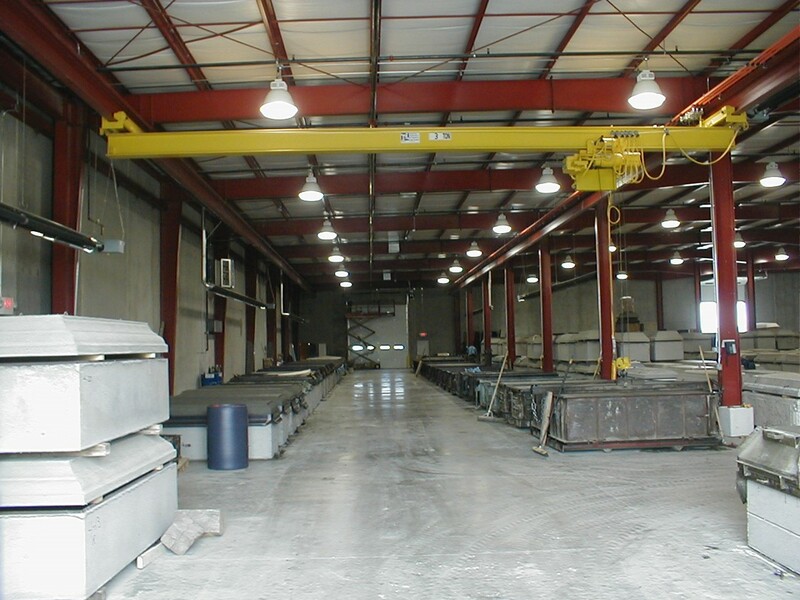 This allows cranes to have a higher capacity and/or large span with using a smaller, less costly bridge beam. 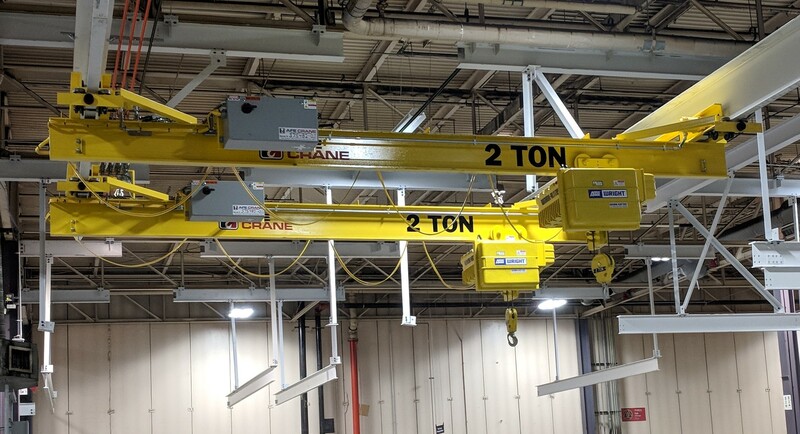 Using more than two end trucks also improves the crane’s runway system by reducing hanger loads. 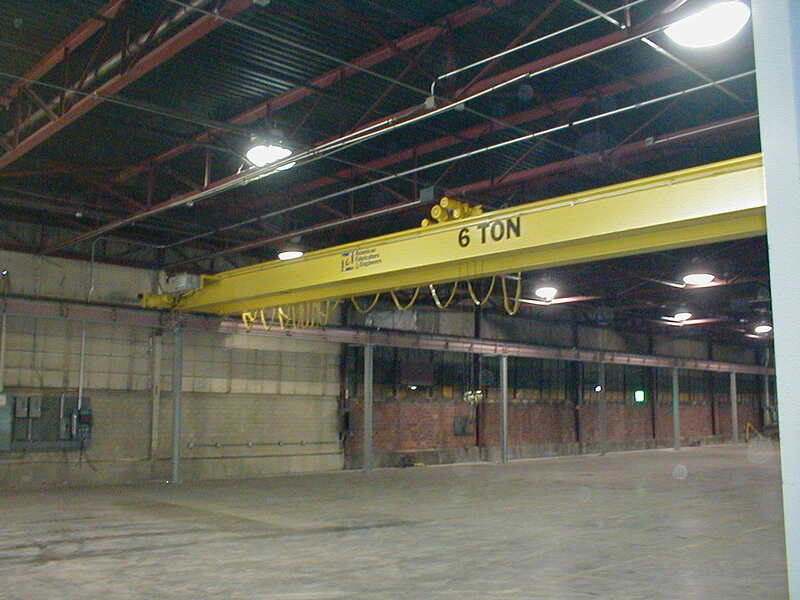 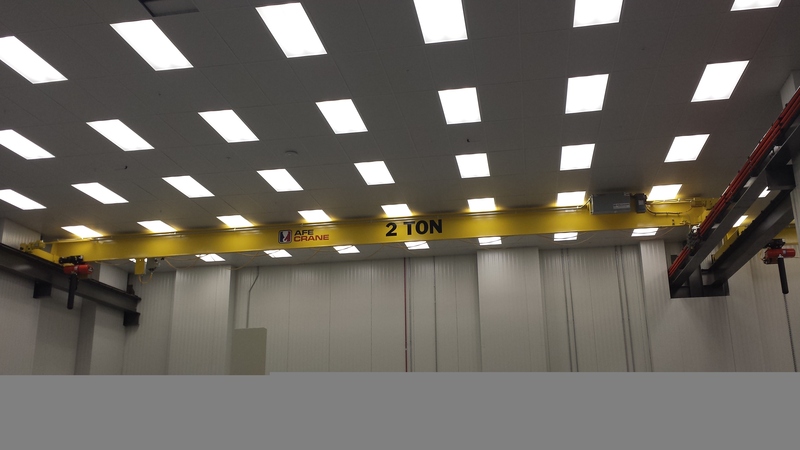 The runways for UHSG cranes can be freestanding and ceiling mounted (if building is suitable). 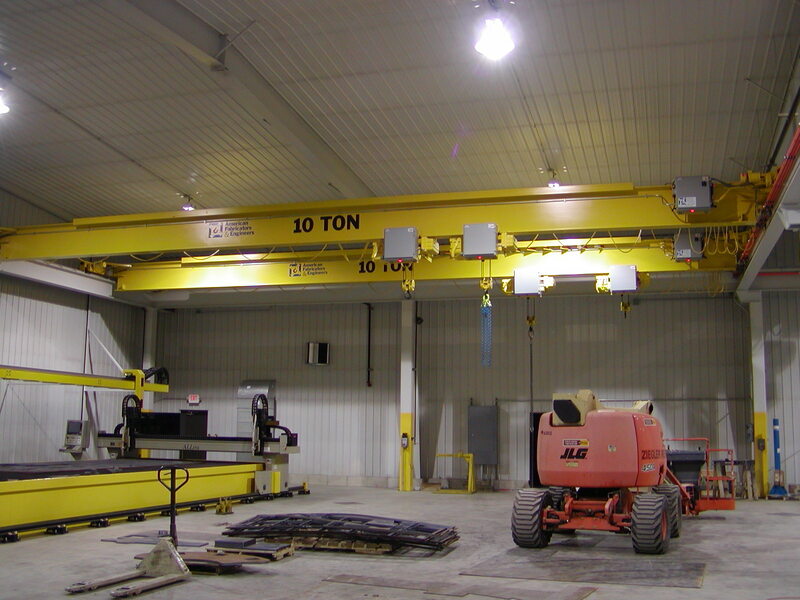 An Under Hung Double Girder (UHDG) crane shares the same traits as an UHSG crane. 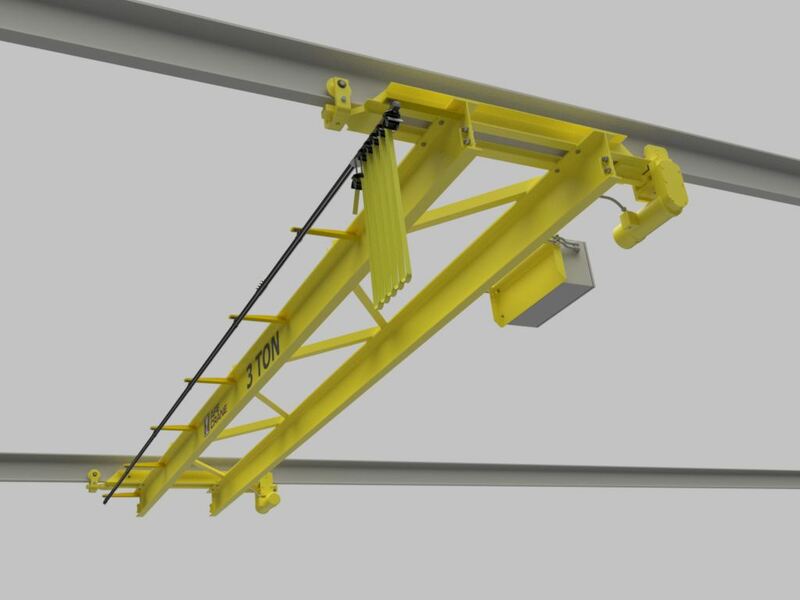 The additional bridge beam allows the crane to reach a capacity of up to 20 tons. 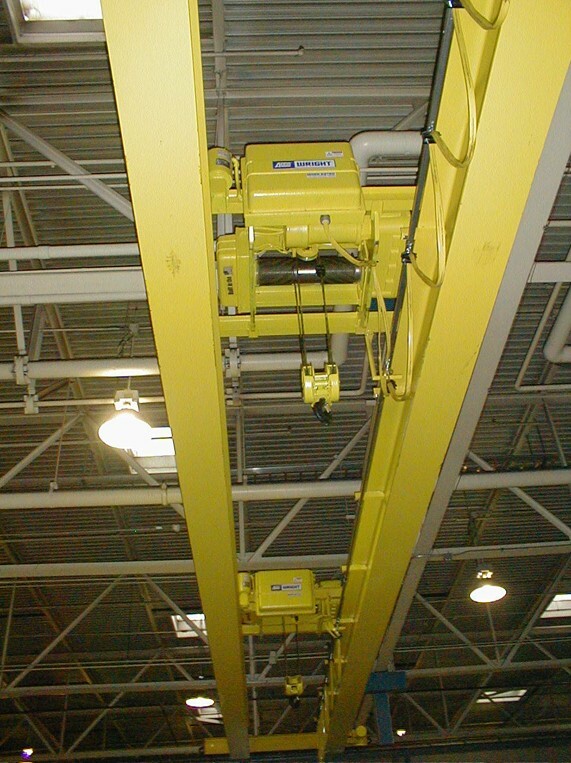 With the addition of a second bridge beam, both top running and under hung hoist trolleys can be used. 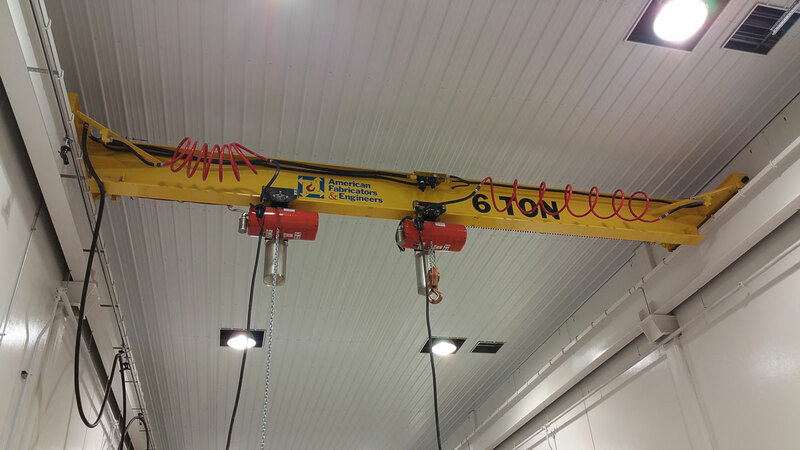 For most cases, a UHDG crane can have a better high hook than a UHSG because the hook can be mounted between the two bridge beams. 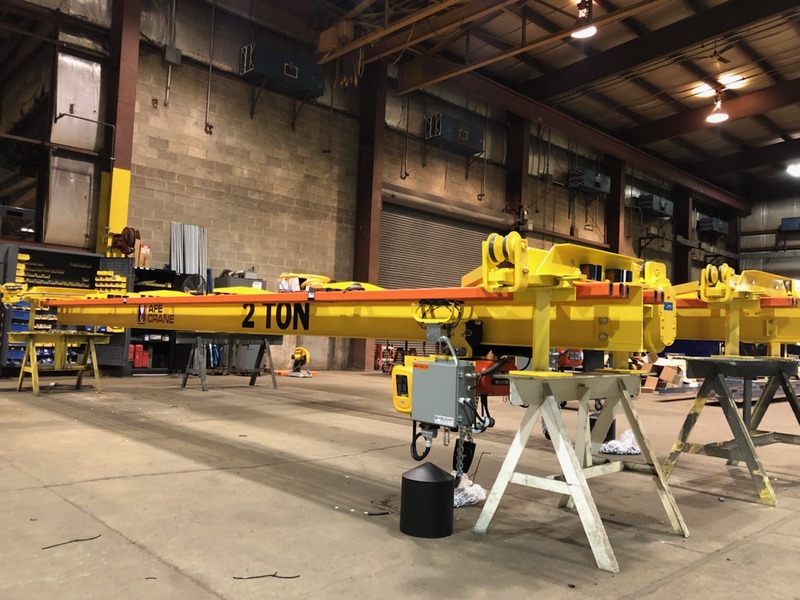 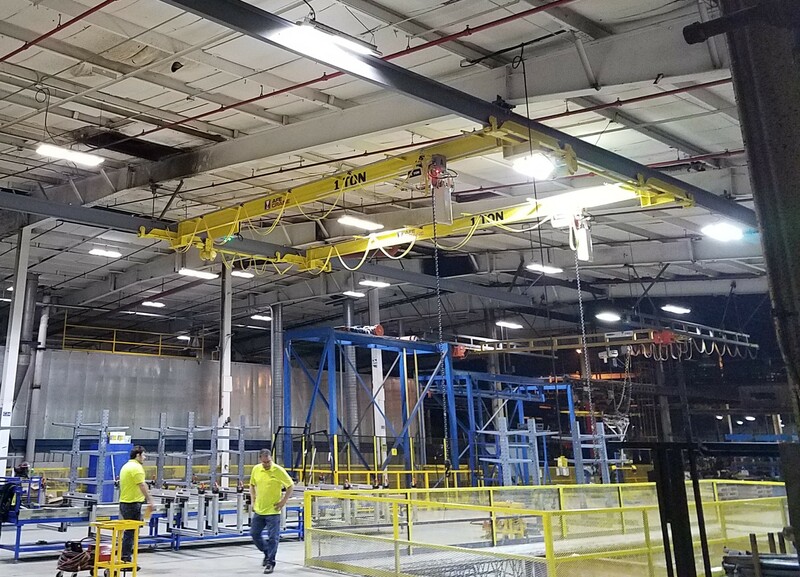 Double girder cranes also have a better means of handling large moments caused by a stacker, part manipulators or components other than a hook.